Focus people, focus. When they say we built this they are referring to private businesses, not public venues. 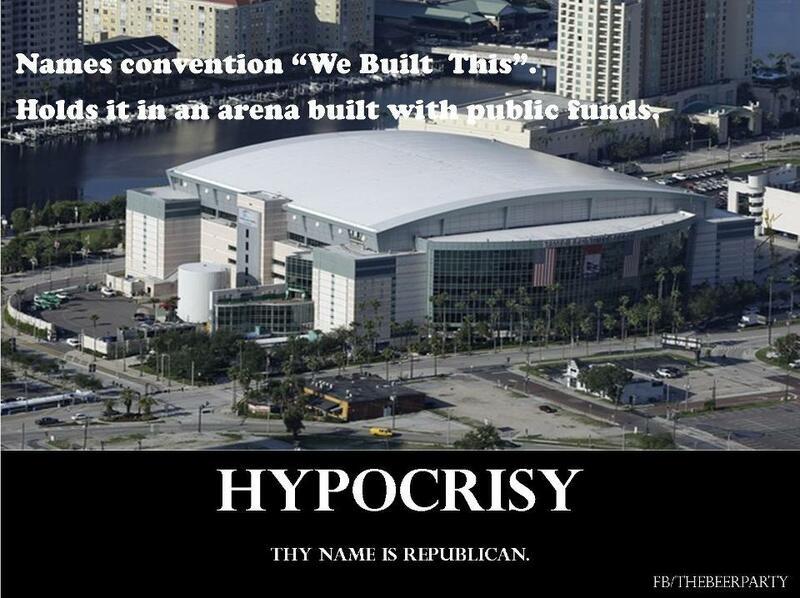 Hypocrisy, your name is Watauga Watch. Again, JW, it takes one to know one. This is what gets me about the "I built it" crowd - no humility, no recognition of the role that anyone or anything else might have played in their success. Are we to believe that Romney is a self-made man when his father was a very successful and wealthy businessman and politician? Ann Romney has described the "hard" times when they had to live off of stock investments that Mitt's dad had made for his son. I think they cannot imagine what it is like to have NO family money, maybe even no family at all to rely on. That is probably what worries me most about a Romney presidency. He does not understand what it really means to have to pull yourself up by your bootstraps, and why many people struggle to do that. We to Republicans means "pee" on the working people. Their motto, "make the working man/woman think our wealth will trickle down and get the government out of our way so we can rip off the middle-class and poor some more." It's more than hypocrisy JW, it's straight-up trickery. How can anyone build a private business without the public infrastructure? How do you ship your goods if not on the public roads? Who are your employees if not public school graduates? How do you guarantee the quality of the food you serve without government regulations and inspectors? How do you communicate and without government satellites placed in space as a result of the GOVERNMENT space program, and internet? Who pays for the public infrastructure? Taxes on private businesses and those they employee. Government can do nothing alone. I has to be funded by the private sector. You can NOT use logic to change the opinion of someone who didn't use logic to form that opinion in the first place. Government is all of us working together to create a decent society. That is the American dream. The Republican dream is a plutocracy - government by the wealthy for the wealthy. This was not posted by Opoib, I have someone trying to make my opinion look like something it is not by posting under my name. What did Opoib just say? I don't understand your point? And btw, I NEVER post as someone else. And btw, I really hate these verifications. You all miss out on many of my comments just because I can't read the damn things. Someone made this post in my name. I thought you might be a likley candidate since i am nothing but a parasite to you. I'm sorry someone used your username to try to put words in your mouth. I've never understood why someone would want to do that - it seems very underhanded. I for one appreciate your comments here even though we don't agree on everything. Why does this site put us through that verification crap. It's like they want to discourage us from posting and then they censor what we post anyhow. Again this is not a post by me. Brushfire is just making himself look bad it is a quote from one of his posts. As always my posts have my name as a clickable link to my blog sorry JW. I hope that was permissible in defending my name here. Why does this site put us through that verification crap. It's like they want to discourage us from posting and then they censor what we post anyhow." So that venue you think we're talking about. How many private businesses do you think it actually took to build it?